Spring in Buffalo & Rochester, NY often leads to leaky basements. Whether you’re doing laundry or lounging in your man cave, your basement is a functional and valuable part of your home. When snow melts and spring rains make their way into your home, what do you do next? Is the damage excessive or have your belongings been ruined? 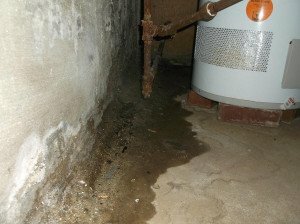 There are a few things to consider and action you can take when finding water in your basement. Before giving our waterproof basement flooring a shot, take steps to salvage your belongings and prevent further damage before our specialists arrive. Evaluate any furniture near the leak or puddle. Move any and all furniture in the area to a dry section of your basement. Remove belongings from any cardboard boxes that have gotten wet. Discard the wet cardboard and dry off the belongings to avoid mold formation. Dry wet areas of the basement floor. We recommend using a Shop Vac for affected carpet to soak up any water absorbed by the flooring. Once dry, roll back the carpeting to expose and air dry the underlying padding. Use towels and mops for hard floor surfaces. Once water and belongings have been removed from the affected area, we suggest running a dehumidifier to prevent mold growth. We understand the many thoughts and concerns you have when encountering a leaky basement. By following the steps above you will be lowering the risk of mold formation in your home and limit more potential damage. These steps are designed to help you get the water under control until our professionals handle the root of the issue. If you do happen to find water in your basement, don’t hesitate to call EverDry Waterproofing of Upstate NY immediately. There is no time to waste – no matter how small the leak appears, the problem can lead to costly damages if not handled as soon as possible. Call EverDry of Upstate NY today to have our waterproof basement flooring installed. Whether you're located in Buffalo, Rochester, or the surrounding areas- we can help.